CHASING FOOD DREAMS: Tery Pork Café, Kuchai Entrepreneurs Park: Indulging in Everything Pork But the Oink! Tery Pork Café, Kuchai Entrepreneurs Park: Indulging in Everything Pork But the Oink! Hogging a Journey of Fusion Fare with Western, Japanese and Chinese Dishes! Armed with a huge pang of hunger for hogs, I braced myself as I entered Tery Pork Café, located in the bustling area of Kuchai Entrepreneurs Park. I believe there is also another branch at Southgate Mall in Kuala Lumpur. Located on a less populated row of shop houses, Tery Pork is situated all the way at the inside of the area so one needs to locate this with extra effort. Merely 8 months old, Tery Pork café at Kuchai Entrepreneurs Park specialized in serving a haven of pork fare. The café uses a fusion of concepts from Japanese marinades, Chinese cooking techniques and Western presentation. Everything is made in house and fresh on daily basis. Décor was minimal and quite bare except for some piggy ornaments and basic essentials. 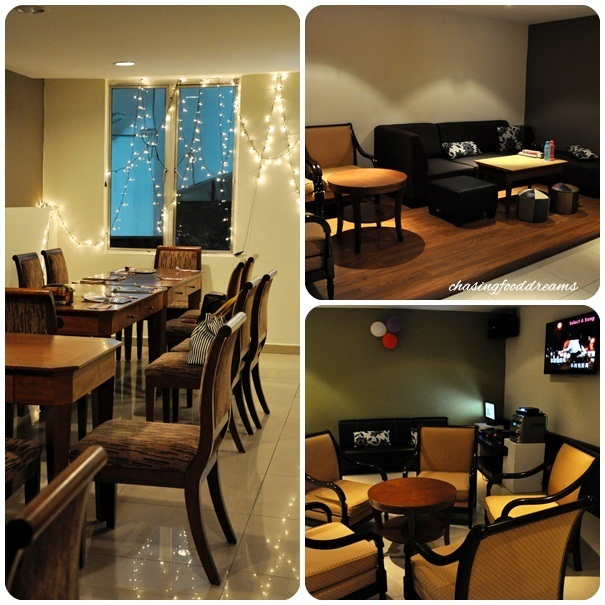 There is also a private room on the second floor if one wishes to have a private function and guess what? It is equipped with Karaoke! Ornament lights added a little charm to the room and plush sofas also added a comfort feel. Looking forward my meal, I checked out the menu and was ecstatic that the dishes were filled with a long list of pork dishes! Drink list was decent and filled with some unique selections of fruity blends. The atmosphere that night was filled with merriment. Foodies were already oinking with delights while plans of karaoke were debated after tummies were satiated were in place! Drinks came, wowed us and left us refresh and quenched. Particularly worth its juices are Vanilla Dragon, Sour Plum, Soursop and Yam Taro. The fruity concoction was just invigorating and icy cool. Other drinks we had were Blueberry Green Tea, Early Grey Milk Tea and Iced Chocolate. Beers are also available but no wines for now. Prices start from RM2.50 to RM6.50 while beer cost more. Salads make me choke but not this One! Freshly Green Salad with Sliced Pork Streaky (RM10.90) sounds like music to my ears, especially the last part. Simply dressed with an option of Goma or Balsamic Vinaigrette, we went for the first. All I could focus on was the bacon! Look at the strips of succulent layers of goodness. I think my heart missed a beat while I was checking out the bacon (sounds a bit wrong… hehe!). Simple greens but the sesame dressing was very good and tasty. Bacon, of course, makes the salad a super star… hehehe. Ah… sausages and not just ordinary ones, pork sausages! Three little piggies (or should I say doggies?) with each seasoned differently… two Western and one Asian. Served on a bed of mashed, side salad and strip of streaky bacon, the platter was a dream for hog fanatics! Named aptly West East Sausages with Streaky Platter (RM25), I couldn’t resist but to swooned at this dish. Both Western sausages tasted different with one a bit more peppery than the other while both had great bouncy textures with crispy skin and tender insides. I also adored the Thai sausage with its sweet flavors. Sharing is Not recommended for this platter! There are hard ribs and there are soft ribs… which one do you like? Apparently hard ribs or back ribs are the bigger ribs filled with lean meat while soft ribs, also known as baby back ribs, have fattier meat studded with soft bones for chewing. At Tery Pork, both are offered in the same style and served with mashed potato and side salad. I simply preferred the Baby Back Ribs (RM38.00) over the Back Ribs (RM35.00) simply because it has more flavors with the slight mix of fat while the soft bones give your jaw a good run of exercise. Flavors are a blend of sweet and smoky tones with a nice savory taste. Make sure to lick the bones clean and savor the mashed with brown gravy. After the dishes of Western fare, our Ramen with Braised Pork Rib and Bacon (forgot the price for this) showed up looking innocently beautiful. Yes, noodles were quite ordinary and so was the braised egg. The wow factor was the piece of delectable pork rib wrapped snuggly with bacon. Sink your teeth into gorgeous tender rib with succulent bacon to boost up the goodness. I dare say, one piece is certainly not enough to satiate my hunger. Tery Pork should put a few of these ribs with bacon on its own and served with mashed potato! Pork Shoulder Steak (RM25) was served with crinkle cut fries and side salad. Tender marinated pork shoulder was quite lean except for a strip of fat at the edge. Juicy and a little sweet, pork was really easy on the palate. The brown gravy was also quite light and provided much goodness to the pork. I wouldn’t mind a bowl of rice with this either. The Pork Meatball Spaghetti (RM12.90) was average in my books. The tomato sauce was decent but not deep enough in flavors. I simply prefer a richer tomato taste in my spaghetti. Pork meatballs were tender and moist enough. For the price of the spaghetti, I would not comment much. I liked the creativity here in Crispy Thin with Roasted Pork and Minced Meat (RM9.90). The combination of the roasted pork was not too outstanding here but the flavors are pretty good. Topped with loads of cheese, the pizza was really juicy with fresh tomato slices and onions. Flavors were sweet and tangy with hints of salty flavors from the pork. Others raved in delight at the pizza despite its bits of burned edges. If there is one thing to order at Tery Pork, go for the Stone Bowl of Salted Fish and Belly Rice (RM9.90)! A Chinese favorite pimped up ala Korean style with the hot stone bowl is simply pure genius as the hot bowl provided a crusty edge to the rice. A raw yolk is set to add smoothness and flavors to the rice when mixed together. When the rice is mixed up, leave it for few minutes to get the crusty rice at the bottom of the bowl. This bowl is a myriad taste of salty aromatic salted fish with luscious flavors of the tender pork belly and spring onion taste. A powerful combination that is made even better by the chef at Tery Pork. Kudos! As we could not get enough of the sinful pork rib with bacon earlier, we ordered another ramen but this round, they ran out of the rib. Ramen Braised Pork Shoulder Meat (RM10.90) was good but not great because I thought the rib with bacon was more outstanding. Oh well, as they always quote in Chinese, ‘Even if there is no fish, prawns are also good!’ wink wink!! Going local, we took on the Pork Rib Rendang with Rice (RM11.90) happily. Drool worthy rendang sauce was rich in spices, creamy and spicy with a kick. Served simply with rice, fried egg, cracker and side salad, the dish is a good take on the infamous rendang. I swear buttons were really going to pop but the dishes were still coming. Green Curry Pork Shoulder Ramen (RM9.90) showed off the Thai influenced in the café. The green curry was dearly creamy and loaded with lots of spices and herbs. It wasn’t too heavy like most curries, making slurping the ramen a breeze! Accompanied by pan seared pork shoulder, soft bean curd puffs and greens, the noodles are good for lunch. Aglio Olio style, Spaghetti with Pork Sweet Sausages (RM10.90) exuded sweetness in a good way. The pasta was again ordinary but the Thai sausages stole the show. Fairly light in flavors, the dish is something pleasantly easy to eat for diners all ages. I would kick this up further with chili flakes… hehehe! Last but not least and bursting to the max, Sid the Kid had to order a Stone Bowl of Ginger Sausage Rice (RM9.90). After the sensational experience in the earlier stone bowl, Sid decided to replicate the sensation with a second bowl. This version was good as well but I thought the earlier one was more vibrant in flavors because of the aromatic salted fish. If you are not a salted fish fan, then this one would be more suitable. It’s been an amazing year of dining with my foodie friends, so much so that we have become family! Here’s to more beautiful friendships and fabulous food to come... oink oink! They say to always stick to what you know best in order to achieve success! At Tery Pork, they sure know their hogs really well. It showed in the passion they have for honoring hog lovers with a luscious array of delectable porky dishes that has been injected with a great combination of East meets West concept. Not much of an ambience but the dishes are truly great in taste and portion. Price is pretty decent considering pork is so expensive nowadays (one would know if they buy fresh pork). Choices are plenty from soups, salads, sandwiches, burgers to pasta, pizza, ribs, local dishes and stone grills. Fear not for those who do not share hog passion, there are also some seafood, chicken and lamb at Tery Pork. *And yes… we did end that night with a little karaoke! We really pigged out that night, haha! It all looks delicious...thanks for sharing! look damn nice weih! saliva dripping!!! Do feel free to view my blog!